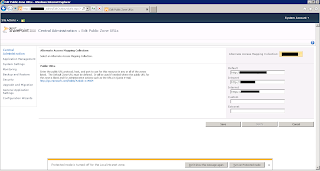 This post is about configuring https on SharePoint 2010 web application running on multiple load balanced IIS 7 web servers. Assuming you already have a digital certificate, follow the coming steps. If you do not have a certificate, you can either purchase or create a self signed certificate but in that case you will receive a warning in the browser when opening the website. I have downloaded the server certificate I purchased as a p7b file. On the web server I go to Internet Options -> Content -> Certificates. I choose the "Intermediate Certification Authorities" and click import then point to the p7b file. If you receive the error message below, do not worry about it, the certificate was installed nevertheless. Go to http://support.microsoft.com/kb/959216 fore more details. "Cannot find the certificate request that is associated with this certificate file. A certificate request must be completed on the computer where the request was created." 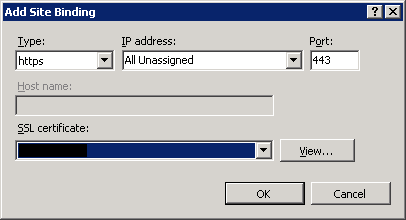 I opened the IIS Manager and went to Server Certificates, the certificate appears there now and the domain name shows in the "Issued to" column. Since I have other load balanced web servers, I am going to export the certificate from here as a pfx file to import it later on the other servers. So I right click the certificate, choose Export and fill in the path and password. The configuration on this server is now completed, I copy the pfx file I generated earlier to the next web server. I imported first the CA certificate in the "Intermediate Certification Authorities" as I did on the first server then go to IIS Manager -> Server Certificates -> Import, and browse to the pfx file. Configure the bindings as before and repeat for all other load balanced servers. 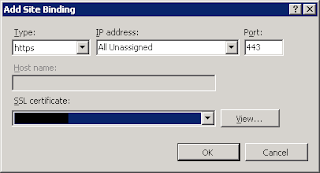 After all the IIS servers are configured to accept https for the website, there is only the SharePoint configuration left. From the Central Administration go to "Configure alternate access mappings" under "System Settings". Now the HTTPS access works.